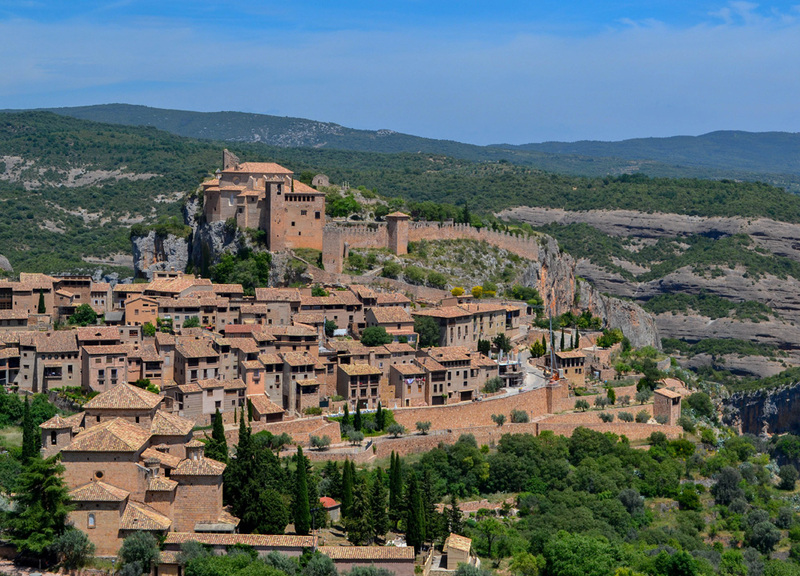 Ironically the single, best individual day of our French road trip, was in Spain, when we travelled through the Pyrenees from France’s seaside city of Biarritz to our planned destination of Alquezar, a medieval village in the mountainous Huesca Province. The journey follows a number of fascinating and unexpected contrasts along pristine and empty roads, through landscapes of towering dry rock structures and bright blue lakes. For much of it the land is dry, almost desert-like, and when we get out to explore we are always met with the the deafening drone of cicadas. It’s 30’c outside, we feel like we are in Mexico, yet there’s still snow on the further Pyrenees peaks on the backdrop. I wasn’t involved in planning this part of the road trip so, to me, it was a somewhat surreal surprise. I honestly didn’t think places like this existed in Europe and, to find it so close to where we began, just made it all that more fascinating. My previous experiences of Spain have always been of beach resorts and the southern costas (many years ago) and, because of this, Spain has never appealed to me in the more recent years. Until Alquezar Huesca, and now a proper Spanish road trip is on the cards. When we arrive it is through winding roads between olive groves as we open out to limestone cliffs as we look down from above to Alquezar. The medieval village sits on an outcrop over deep canyon caverns, and vultures circle from above. As we continue into centre there are ups and downs, and twists and turns before finally reaching the cobbled paths of what would normally be restricted to visitors. I find centre’s of similar medieval settlements are often pedestrianized these days, so it feels quite odd to drive through them. I have been to similar where, in France for example, we visit medieval citadels and communes such as Carcassonne, Les Baux-de-Provence and Rocamadour. You pay extortionate parking fees outside to do little more than traipse through crowds and tourist tack, and back out again. In contrast, Alquezar is very local as we step out onto streets so cobbly they hurt your feet. The church bells ring through the streets on our arrival and return every hour, and half hour, through the day. Spain tends to be cheaper than France so we make the most of the one night where we will actually afford a nice hotel and slap-up meal. I can say that both together came to around 100 quid (130 Euros) which in France is similar to a stay in a basic Ibis Budget hotel and your normal evening meal for two. We stay just the one night at Hotel Villa de Alquezar, which has a nice swimming pool and whatnot, but we chose it more for the balcony views. I actually wrote most of this post from the balcony which overlooks terracotta tiled roofs and further to the valleys and canyons. It’s an idyllic spot which is fortunate as Fanfan managed to lock me on the balcony for 40 minutes while she had a bath. Swallows glide between roof tiles and the vultures continue to circle above the canyon. There were 11 vultures on my first count, but now there’s a whole lot more now. I also bought two beers for lunch, an Estrella Damm and a San Miguel, from the local tobacconist. On the streets below I hear conversation of elderly folks and shouting children in what I’m guessing is Spanish (I don’t know Spanish). We also have a reservation at the top restaurant in the village, at Casa Pardina. I am not certain how impressive this is given Alquezar is a remote village with no more than 400 people, but it definitely felt swank. It’s air-conditioned, surprisingly relaxed and there’s a window view framing Saint Michael’s church. We both go for the fixed price three course menu which has plenty to choose from, including locally sourced game meats such as rabbit, deer and wild boar. Fanfan goes for pepper stuffed with codfish, grilled rib of beef, and a gin and tonic sorbet. I go with hearts of artichoke with garlic and ham, traditional Somontano style wild boar and a chocolate and almond crepe. The price includes a bottle of Somontano wine (we are in Somontano one of Spain’s prominent DO wine regions) and sampling of locally produced olive oils. I am in no way an olive oil aficionado so it was interesting to actually taste the differences. Overall a great meal and experience and there’s plenty I would go back for. Leaving the restaurant we walk down towards Saint Michael’s church which is beautifully lit at night, as goes for the entire village which reaches up to a medieval castle and the Collegiate church of Santa Maria. Given time we would definitely have explored further and higher but, in total, we spend less than 24 hours in Alquezar (we will definitely be back). Set next to Saint Michael’s church is the Main Street and central square of Alquezar with Al Fresco dining (or Al Fuera as it would be in Spanish) where we stop for olives and Sangria. Surprisingly it is the weekend in early summer, yet there’s next to no people or tourists. This to me is the real advantage of Alquezar where it feels almost like a medieval village of our own. Given its remote and off-the-beaten-track location it tends to be overlooked by tourism and, going by shopfronts and tourist information, the tourism that does exist would be focused on canyoning and rock climbing, understandably. It is also perfect for the bird nerd. (Check here for full list of hotels).